ParleVision is a free, open-source framework for rapid prototyping of computer vision applications that allows non-programmers to visually compose transformation pipelines using a drag & drop interface and provides a simple API so even inexperienced programmers can write extensions. To get started, follow the README on the project’s GitHub page. 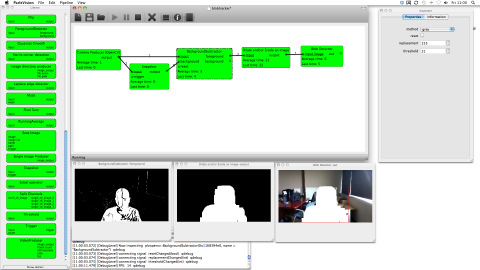 When building natural interfaces, interactive installations, conducting research into human-computer interaction or something else that requires a computer vision component, it can be frustrating and difficult to get started. Whether the goal is to perform object tracking, face recognition or something else; there is always a lot of work involved in capturing video from a camera, cleaning it up, converting between colour spaces and so on. ParleVision provides a framework where all these steps can be written as reusable elements in a computer vision pipeline. ParleVision has a simple GUI that allows users to compose pipelines from existing elements using drag & drop. Simply drag elements from the library to the canvas and connect them by drawing lines from output to input pins. For elements that have settings or parameters, these can be changed in an “inspector” panel. Monitoring the results of each transformation can be done in real-time, by double clicking on the name of the output pins to observe. ParleVision itself is modular, so you can run it headless without a GUI or embed it in your own project if you want. ParleVision is built on top of Qt and OpenCV (although you can use other computer vision libraries if you want). This means it runs natively on Windows, Mac OS X, Linux, BSD and any other platform supported by Qt and OpenCV. The source code can be found on GitHub and is provided under the GNU Lesser General Public License (LGPL). This means you can use it for commercial or noncommercial purposes, that are free or proprietary. If you make any changes to the framework itself, you are required to contribute those changes back. Contributions are very welcome and easy to make: fork the project on GitHub and send us a pull request. ParleVision was built by Michel Jansen and Richard Loos to scratch the itch they felt when working on Anemone. It is maintained by the Human Media Interaction group of the University of Twente in The Netherlands.